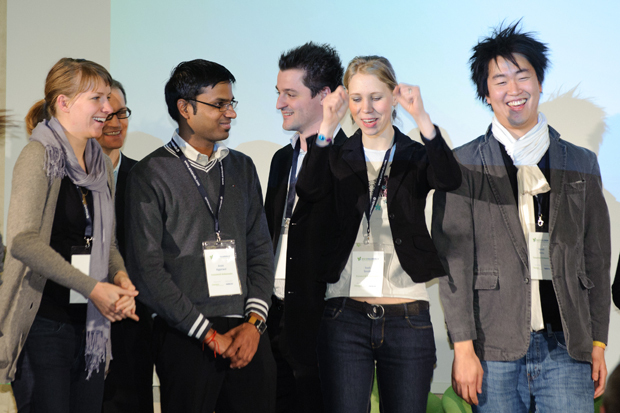 The photo above shows happy Ecosummit Ambassadors on stage at the end of ECO11. We are grateful for the support of our ambassadors and look very much forward to hearing from you soon. 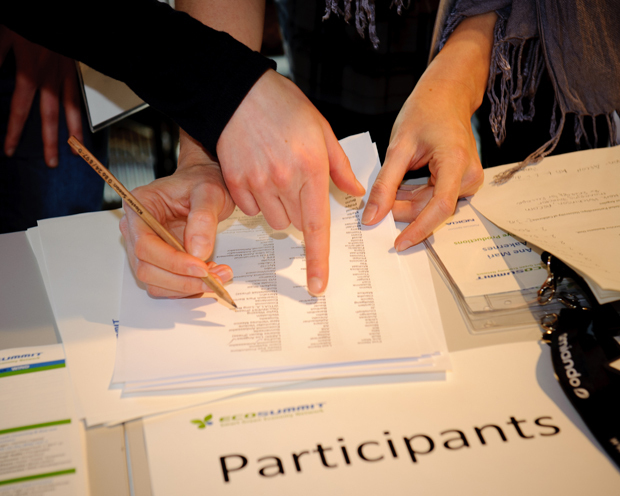 To apply for the role of Ecosummit Ambassador please email your CV and motivation letter to ambassador@ecosummit.net. Ecosummit Ambassador Dinese Yoong from Malaysia: Ecosummit plays a very important role as a bridge between business and environment. Nothing is more important than balancing the act of economical activities and at the same time giving it back to Mother Nature. This is what moves me to support this summit as well as to enlarge the Smart Green Business Network. The future for sustainability starts here. Ecosummit Ambassador Marija Stamenkovic from Serbia: For me being Ambassador at Ecosummit means numerous opportunities for socializing, networking, talking and connecting climate related issues and new business opportunities. Ecosummit Ambassador Raja Singaram from India: I am a doctoral researcher and my thesis will focus on how various stakeholders, starting from the founders, suppliers, strategic partners, launch customers, venture capitalists, policy makers etc., contribute to the co-creation of a cleantech startup. Ecosummit 2012, to me, is a great event that brings together various stakeholders from the green value chain who need to collaborate to make any sustainable product or service idea a reality. Hence I would like to take the opportunity of serving as an Ecosummit Ambassador to expand my knowledge and network within the smart green business sector. Ecosummit Ambassador Maria Peeva from Bulgaria: Ecosummit is a great chance to exchange passionate green ideas about exploring innovation and entreprenuership in cleantech in the heart of Europe. I want to be part of the network and contribute to connecting people excited by the idea of generating value through sustainability and fostering the environment. The green future makes the world better. Through my tiny participation I would like to support individuals and companies to better understand why is it important to invest in green energies. Ecosummit Ambassador Björn Petersson from Sweden: I feel honored to have been selected as an ambassador and to become a part of Ecosummit. For me it’s a great opportunity to be more actively involved with the green movement and to extend my personal network and meeting people with mutual interests. I’ve always been passionate about environmental and climate change issues. I’ve studied eco-tourism and environmental and climate related subjects on university level, and I’ve been following the Scandinavian stock markets as an investor during the last 15 years now, always focusing on environmental friendly technologies. I’m currently involved in a regional workgroup of researchers and politicians, our goal is to improve the conditions of the Baltic sea. I feel that the main challenge for mankind is to change the everyday habits of the individuals. I want to help spread the consciousness of a world-friendly way of living, green technology of course being of great significance. Real change has to start on a personal level, as Ghandi said: “Be the change that you want to see in the world.” In times of global warming and catastrophes worldwide, I still believe that it’s never too late to do as much as possible to keep our planet habitable for future generations. Ecosummit Ambassador Munyaradzi Chivasa from Zimbabwe: The Ecosummit provides a great opportunity to participate and learn from those at the cutting edge of smart, clean and sustainable business. The opportunity to rub shoulders with those currently in practice would be extremely invaluable to me and will serve to complement and give direction to the theoretical knowledge I have so far gained through university. Ecosummit Ambassador Marcus Lehmann from Germany: My passion for renewable energies started with my final thesis during my high school time about building and describing the technology behind a solar model car. Meanwhile I am about to finish my diploma in mechanical engineering at the Technical University Munich with focus on renewable energies. Before and especially during my exchange semester at the Hong Kong University of Technology my interest in entrepreneurship increased. Thus the Center of Digital Technology Management (CDTM) accepted me as a student for the secondary study in Technology Management and through this I heard about the Ecosummit. As I am already looking for topics in the field of renewable energies to write my diploma thesis and planning to become a founder in this area, the Ecosummit is an excellent chance to get next to inspiration in touch with people with similar mindset to exchange ideas, to get to know companies, start ups, founders and especially new and state of the art technologies and innovations in the field of green technology. Ecosummit Ambassador Christian Hodgson from Germany and USA: It is an honor to partcipate in ECO12 as an ambassador. 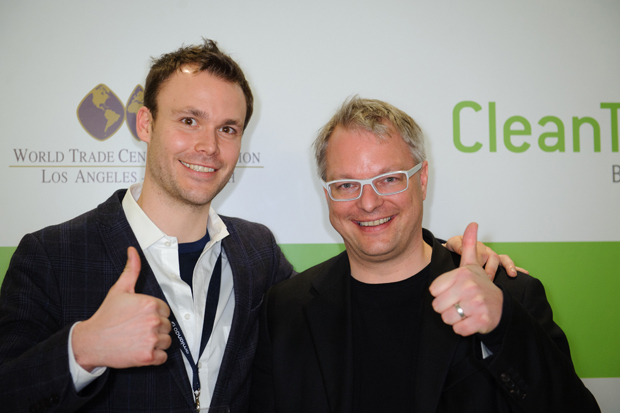 Having followed the event and the industry for a while, I think you are doing a great and important job in linking high-potential smart green startups with the VC community. With experience both in energy and cleantech, as well as in events anywhere from 50 to 500.000 people, I hope to contribute a little bit to making everybody’s participation a great experience. Having lived in ten countries – currently in Ghana – I am especially looking forward to exchanging ideas on cross cultural partnerships. Let us turn the transition to a green economy up a notch! Ecosummit Ambassador Bünyamin Yildiz from Turkey: Green ideas attracted me with its lasting effects on the society, economy, companies and people’s lives. Therefore, I‘m trying to build a strong analytical skill in my graduate education at Technical University of Berlin in Innovation Management and Entrepreneurship. My goal is to become a leading, innovative, solution and teaching oriented, competitive, prolific, green and dedicated academic. Thanks to being an Ecosummit Ambassador, I can further contribute to the Smart Green Economy and share my opinions with others to convince them that the green domain is the only future of the world. Ecosummit Ambassador Jan Christlieb from Germany: I am a passionate social entrepreneurship supporter and strongly believe in the power of sustainability. That is also the main reason why I want to join the summit, simply to learn more about the companies at the cutting edge of the sustainable, green movement. Further, I am keen to get in touch with those leaders, expand my network and simply get inspired by their ideas. At Forrester Research I assisted among others in organizing and accomplishing the one week IT Forum in Lisbon and last year I worked as an ambassador for the Berlin Music Week. Consequently, I have got experience in welcoming and assisting guests during event registration, speaker management, and Q&A support. Moreover, I am willing to help during the two days wherever help is needed to secure a smooth event. Ecosummit Ambassador Karina Zittel from Kazakhstan: Being a part of such extraordinary and interesting event will give me the possibility to enhance my gained knowledge in the field of renewables and my network with people involved directly in this field. Through my experience in event management and my studies in Innovation in Netherlands and Berlin I think I can contribute to a great extent to the organization of Ecosummit and provide a pleasant working atmosphere for the participants. As the green technology is changing in a very quick pace, I am thrilled to learn more about recent research and newest developments. Being inspired by ambitious and ecology-minded entrepreneurs I will be very excited to be part of Ecosummit 2012. Let’s create a brighter and cleaner future together! Ecosummit Ambassador Sebastian Dehling from Germany: I’m a supporter of renewable energies for a long time based on logical reasons like ending resources but since I read the book “The Energetic Imperative” of Hermann Scheer, I am really inspired about the idea that energy could be produced locally where it’s consumed and in a sustainable manner. This is an issue we cannot postpone and I feel that society has to push the green economy to urge governments to make smart and groundbreaking decisions. I love to support the Ecosummit and its participants as an ambassador to learn more about the innovations startups create in cleantech and for smart green cities and engage in networking. Sharing ideas and knowledge to push the transformation of the economy to become green truly motivates me. Ecosummit Ambassador Hannes Zimmermann from Switzerland: I am Hannes, recently graduated as environmental engineer at ETH Zurich. I love business models which help to reach a more sustainable world. I did work on such models already in the two pioneering carbon companies South Pole Carbon and myclimate. Furthermore, I reached much attention for the proposals of an intelligent e-bike-sharing system as well as a vision for the Swiss developing cooperation. Nowadays I am working on innovative business models to reduce CO2 emissions. 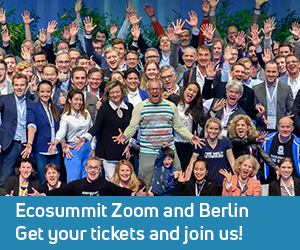 It would be a pleasure for me to assist in getting a smooth Ecosummit 2012 in Berlin as well as getting connected to many interesting like-minded people. I am sure the green crowd in Berlin would as well gain some diversity from my presence. Concerning my work for Ecosummit I would like to add that I worked in a tea shop for a year and thus have good experience in direct people interaction for an ambassador – which I can enjoy very much. Ecosummit Ambassador Pau Munoz Garcia-Berlanga from Spain: As a graduate in environmental sciences and current student taking part in the MSc. Innovation Management and Entrepreneurship at the Technische Universität Berlin, I regard smart green business as an essential field in order to improve the efficiency of the whole economic system and to reduce the environmental impacts it creates. The development of new technologies and methodologies for energy, industrial goods and consumer goods’ production and distribution is in my opinion a major challenge in order to achieve sustainability. I am especially interested in the opportunity the Ecosummit 2012 offers me to learn about the state of the art of new environment-friendly technologies and the career options it creates for its participants by bringing together entrepreneurs, students and investors. Ecosummit Ambassador Judith Seetge from Germany: My interest for Green Innovations and Business arose during a project which was part of my company-linked Bachelor program. Here I worked in the team of the e-Mobility Berlin pilot by the Daimler AG and RWE AG. Working closely with electric vehicles I developed high interest into future mobility trends and environment-friendly driving. That is why I also wrote my Bachelor thesis in the smart electric drive department on e-Mobility. Also through and during my master studies of Innovation Management and Entrepreneurship I followed this interest into green technologies and for example worked on a project for the wind turbine business of Bosch Rexroth. I think that the Ecosummit is a great opportunity to refresh my knowledge on green mobility and other cleantech trends and engage for this trend in entrepreneurship as an ambassador. Only through connecting people and ideas ecofriendly business can be pursued for which the Ecosummit is a perfect platform. These developments are not only important for the environment but also for Germany’s role as a high-tech and innovative center which can be further strengthened by active engagement in discussion and conferences. Ecosummit Ambassador Majka Baur from Switzerland: I am a member of the Climate-KIC network and am working as an Education Programme Officer in the Swiss colocation center of Climate-KIC at ETH Zurich. Through the work at Climate-KIC I actively participate in fostering innovations enabling climate change adaptation and mitigation. I really appreciate to work in this area as I believe that considering environmental challenges as business opportunities is a powerful way to reshape our society toward a more sustainable one. Besides my involvement in addressing environmental issues through innovation, I gained entrepreneurial experience by founding and leading an association called weACT. The goal of weACT is to leverage group dynamics in order to motivate and support individuals to change their daily habits towards environmentally friendly ones. I would like to be an Ecosummit Ambassador to meet people who are passionate about the same topics as I am and directly support an initiative that guides ventures trying to run a sustainable business. Ecosummit Ambassador Cinta Azwiendasari from Indonesia: I am a member of the Climate-KIC network and am at present in the process of writing my master thesis about Sustainable Livelihoods at the Natural Dye Batik Enterprises in Indonesia. My intention is to establish a venture in Indonesia which is focused on sustainable development. As an emerging country with one of the highest economic growth rates, I believe there is a lot of unveiled potential which needs to be discovered. However, I realize that a lot needs to be prepared, including building up personal and professional networks. Thus, I believe that being an Ecosummit Ambassador would help me realize my passion. Ecosummit Ambassador Dominika Czyz from Poland: I am a student at Warsaw School of Economics working toward my bachelor’s degree in economics and would like to support ECO12. I believe that my unique mix of business-related academic background, interest in sustainability and previous work experience in the field of social media and journalism makes me an ideal candidate for the position of Ecosummit Ambassador. Being a member of Oikos Warsaw, the international student organization for sustainable economics and management, I have the opportunity to enlarge my knowledge of sustainability and social responsibility. I am a webmaster of the chapter’s official website and support the team while organizing various workshops, meetings and conferences. Ecosummit Ambassador Simon Borkin from UK: I believe my passion and enthusiasm in pursuing a career in the smart green economy, coupled with my skills, experience and abilities in the fields of innovation, entrepreneurship and sustainability would make me a valuable addition to the ambassadorial team. My interest in the ideal of a low carbon economy began after graduating from my undergraduate degree in Social Sciences at Manchester University. I recognised the difficult transition the city faced in restructuring its economy from one of traditional manufacturing to the growing service sector. I wanted to take an active role in supporting the development of the city and the North-West region more widely and so started my professional career as an urban development consultant in which I assisted local and regional government in delivering programmes to support businesses and increase economic growth and employment. It was at this point that I became interested in facilitating sustainable growth in which economic benefits did not come at the expense of the environment and social inclusion. Although I have never attended previously, the relevant content of the conference makes it the ideal opportunity for me. Specifically its focus on promoting a sustainable future through the smart use of new technology and innovation chimes exactly with the values I hold as I try to progress professionally. Ecosummit Ambassador Anna von der Schulenburg from Germany: I am honoured to have the opportunity again to be an Ecosummit Ambassador. Last year was a great mix of innovation, new ideas and passionate and committed entrepreneurs and investors: a coming together of smart, green thinkers and doers. Being at the cutting edge of renewable technologies, environmental solutions and sustainable businesses, Ecosummit 2011 was the perfect place to discuss and network in a fun and relaxed setting. This year promises to be even more vibrant and more international with new startups, new investors and new sponsors. Again, Ecosummit 2012 will bring people together to pave the way to a smarter, greener economy. I am really excited about meeting everyone new and old!